Christmas and Chocolates both go together rather well. It's most likely you'll be spending Christmas with your family and we have an edible box which claims to offer something for you all. 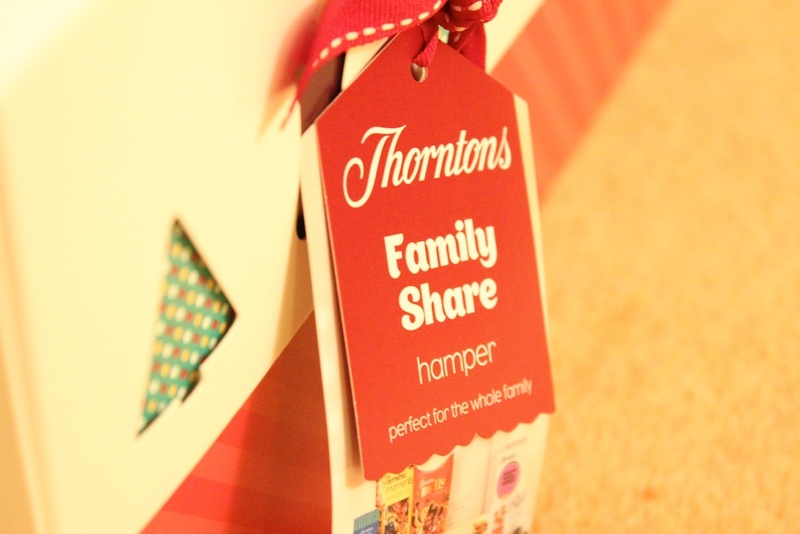 It's called the Thorntons Family Share Hamper and every product is suitable for vegetarians and are all are gluten free too. The presentation of the hamper is top quality. Thorntons products sit within a largish and reasonably weighty box. The box has a base and lid, the base of the box is a coloured diagonally in two shades of seasonal red and graphics of a christmas stockings and trees run along the sides. The graphics are seen through the white lid via cutouts. It's topped off with a ribbon and bow wrapped around the entire box, giving the overall look a classical feel and an exceptionally Christmas spirit. After first removing the lid, I was taken slightly back by the sheer quantity of different Thorntons goods inside. To be specific a 40g bag of Vanilla Fudge Cubes, 40g bag of Strawberry flavoured Marbled Buttons, 40g bag of Milk Chocolate Buttons, 93g bag of Continental Chocolates, 110g bag of Milk Chocolate Caramels, 150g box of Continental Chocolates, 200g box of Caramel Melts, 250g box of Moments (assorted chocolates), 274g box of Classics (assorted chocolates), 380g box of Vanilla Fudge Cubes, 625g box of Original Special Toffees and one Continental Alpini and Viennese Bar. That's a total of 13 items. However for some reason there are two separate vanilla fudge cube and Continental Chocolate items, which seems rather pointless but the smaller bagged versions are for children and easier sharing. The rest of the additions are all different. Mum and Dad will fall in love with the dreamy elegant boxes of Chocolate Moments, Classics and the Continental. Featuring a huge array of white, dark and milk chocolates with a vast variety of fillings. My favourites from these boxes were the creams, truffles and crisps. The caramels are a little generic but the Caramel Melts Box on the other hand is rich and delicious. The children will quickly munch their way through the brightly coloured and animated sharing bags. The Strawberry Marbled Buttons are the best of the bunch. They're literally strawberry marbled with smooth white chocolate and have a uniquely pleasant fruity taste. The Chocolate Buttons weren't anything too special and the Mini Vanilla Fudge Cubes are just smaller version of the boxed skew, included within the hamper. All feature no added artificial colours or flavours. The mixture of different items is good. Thorntons haven't packed the box full of fudges and toffees. This is mostly a high quality chocolate occasion, which I am truly grateful of. Having said that the Thorntons Original Special Toffees are something quite special. The recipe is 70+ years old and apparently hasn't really changed in method or input of ingredients. The end result is a sweet, light and well textured toffee. Overall this isn't just a delicious box of treats featuring something for everyone in the family to share. It's also rather good value for money at the discounted amount of £30 from £45. Thorntons truly are an amazing chocolatier, the fine degree of detail put into the presentation and taste is admirable. They turn the process into an art and should be supported for doing so.